Stoke City ace Xherdan Shaqiri is the most likely player to join West Ham United this summer, according to Football Whispers. The football site claim the Switzerland international, 26, could be headed to the London Stadium in the wake of the Potters’ relegation from the Premier League. 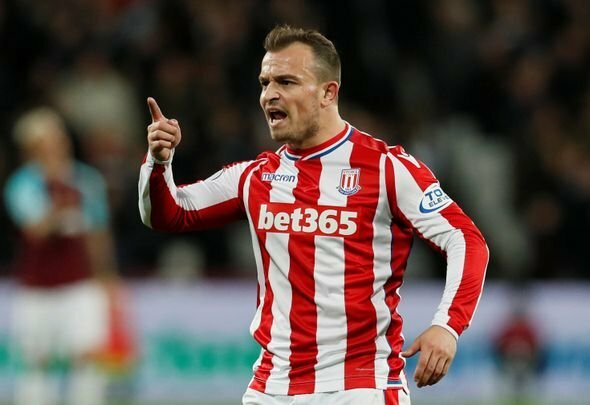 Football Whispers, which gathers all transfer rumours across the globe and calculates the likelihood of them happening, rates it 3.6 out of 5 that Shaqiri will join West Ham, with five the highest possible ranking and meaning it is a certainty. He is top in the rankings ahead of Newcastle United kingpin Jonjo Shelvey (2.9) and Anderlecht midfielder Leander Dendoncker (2.8). Shaqiri would be a cracking signing for West Ham. He was the shining light in a wretched campaign for Stoke, doing more than anyone else bar perhaps Jack Butland in attempting to avert their drop into the Championship. A return of eight goals and seven assists from 36 league matches is a decent return from a player in a struggling side. It was also more than any other Stoke player during the course of a forgettable campaign. Football Whispers value Shaqiri at £24million, which is reasonable enough given his pedigree and the fact he has two years remaining on his contract. Moreover, there have been reports of a £12million release clause in his Stoke deal, although that has not been corroborated. What is certain is that the attacking midfielder will leave City following their relegation. Expect a stampede for his signature, and for him to remain in the Premier League.